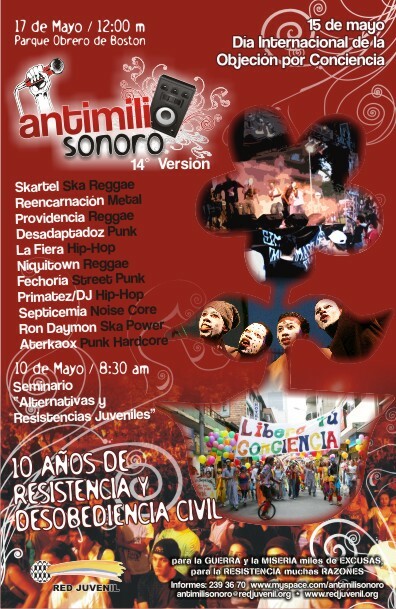 Last May 17th marked the ten year anniversary of the Antimili sonoro [es], an event organized by the Youth Network as a way to spread the word about resistance to the mandatory military service in Colombia through music. The date was celebrated with a concert, and the whole month of May was programmed with conferences, talks and marches commemorating the 10 years of the youth organization's Disobedience and Civil Resistance movement. Showcasing the invitation to the events, the promotional clips and a short video from one of the ska bands playing in the concert. The Youth Network organized their anti-military festival on the international day promoting Objection by Conscience, a means of opting out of the mandatory military service [es] , by explaining that morally the individual believes that killing another human being, even within the military, is wrong. There is testimony from youth who have opted out, as can be seen by this testimony written by Gustavo Monroy [es], recruited against his will and later ostracized by friends and family for refusing to be part of the military. The anti-military group explains their objectives and beliefs in this article in English found in their myspace website. Finally, from the concert, a low cell phone quality video of Ron Daymon ska band performance singing The Neighbor. Hey, if you like it, maybe you can even follow the previous link into the reality show contest for MTV Latin America and give them your vote! Just a quick final reminder that these and other citizen media videos showcased in Global Voices can be found in our YouTube video Channel. 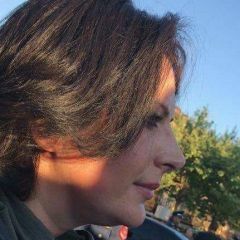 Please don't hesitate to contact us to send your citizen media videos or drop me a line with the video link and a brief paragraph explaining why you believe you've found something that needs to be amplified through our site. Thanks!